Welcome to our unique swim program taught year round in the indoor Holiday Inn Express and Suites - Nepean pool. 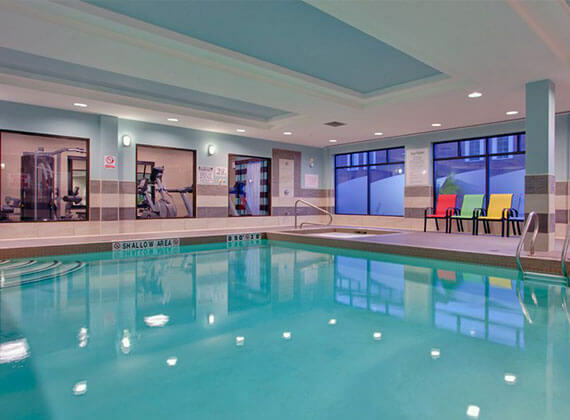 With free parking out front and around the back, a change room, an indoor heated pool, small class sizes, professionally trained teachers and a lovely pool facility, this location is the perfect place for you or your child to begin your aquatic journey. This naturally lit, 50ft salt-water pool is heated to a comfortable temperature and the perfect place to join one of our Swim 101, 201 or Adult Beginner classes. Call us 613-793-0323 or Write to us! There is complimentary parking out front the hotel entrance. We teach lessons year round. Registration is ongoing. MasterCard and Visa automatic monthly payments are accepted for your convenience. All classes are 30 minutes. Each class lasts for 30 minutes: 27 minutes are dedicated to instruction and the last few are for the instructor to give feedback to students and their parents. Your credit card will automatically be charged on the 20th of every the month for the upcoming month’s lessons. For example, October’s tuition would be processed on September 20th. In the event that you need to withdraw your student from class, please email support@theaqualife.ca 30 days prior to your withdrawal. For example, if you wish to withdraw from lessons at the end of November, you must email us notice by October 31. All withdrawals must take place at the end of a month. While you can withdraw from lessons mid-month, you will not be refunded for lessons missed. When you’re ready to return to the pool, email support@theaqualife.ca 2 to 3 weeks before you’d like your child to start and we will send you options for available classes. Payment will be processed immediately to reserve your spot, with the payment schedule returning to the 20th in the month that follows. Due to limited pool time, we do not offer makeup classes for those lessons you choose to miss. Similar to any other activity (such as soccer, swim lessons with the city, or hockey) participants are not afforded the opportunity to "make up" missed class time. While we do our best to avoid cancelling classes, we may sometimes have to do so if there is a problem in the pool and it is not healthy or safe for your child to be in the water. If we need to cancel for any reason, the cost of 1 class will be credited to your account. We aim to deliver a great learning experience for all our students. If you notice something we could improve or you feel that your child is not quite making the progress you would like, please let us know right away! We do remind parents that a child might at times project their initial discomfort in the water onto their instructor. This will sort itself out after a few lessons once they grow more comfortable. If you are unhappy with your lessons, please contact us so we can work together to come up with a solution and keep you or your child progressing in the water. If there is ever anything you need, please don’t hesitate to send me an email at support@theaqualife.ca or give me a call at (613) 793-0323.